Littelfuse SPA TVS Diode Arrays are designed to protect analog and digital signal lines, such as USB and HDMI, from various transient threats using the lowest possible clamp voltage. They offer broader application use and improved impulse protection performance over conventional diodes. These robust diodes can safely absorb repetitive ESD strikes at the maximum level (Level 4) specified in the IEC 61000-4-2 international standard, without performance degradation. 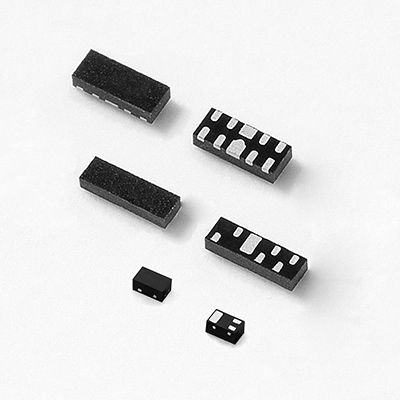 Littelfuse SPA® TVS Diode Arrays, provide high level protection against ESDs, Electromagnetic Interferences (EMI), Electrical Fast Transients (EFT) and Lightning, mainly for sensitive digital and analogue input circuits, on data, signal, or control lines operating on power supplies. These devices work in two ways, first, they absorb transients with diodes, to steer the current, and then, an avalanching or zener diode, clamps the voltage levels. This prevents the device from exceeding its voltage rating. During over-voltage fault conditions, the device must have a low clamp voltage at the specified current wave form to protect sensitive IC's and ports. In normal operation, the reverse stand off voltage must be higher than the equipment supply/working voltage, with low leakage current to prevent power supply loading. The device capacitance must be low enough to reduce input signal distortion. The device package must have a small footprint and low height to enable a high density Printed Circuit Board (PCB) layout. The device must withstand multiple ESD/EFT pulses as specified in the IEC 61000-4-2. 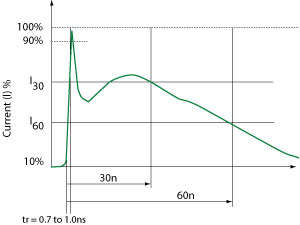 The range limits of the power supply voltage that may be across the V+ and V- terminals. The SCR/Diode arrays do not have a fixed breakover or operating voltage. These devices 'float' between the input and power supply rails and thus the same device can operate at any potential within its range. The maximum forward voltage drop between an input pin and respective power supply pin for a specific forward current. The maximum reverse voltage drop between an input pin and respective power supply pin for a specific reverse current. The device VR should be equal to, or greater than the peak operating level of circuit (or part of the circuit) to be protected. This is to ensure that SPA's do not clip the circuit drive voltage. Maximum of state current measured at specified voltage. The DC current that is measured at the input pins at the stated voltage supplied to the input. The capacitance measured between the input pin and either supply pin at 1MHz/1VRMS applied. Littelfuse TVS Diode Arrays (SPA® family of devices) are an ideal choice for suppressing ESD and other electrical transients as their speed and clamping levels are essential to protect today's integrated circuits. The portfolio offers a wide range of devices to suit the majority of applications available in the market with ESD ratings up to 30kV and parasitic capacitances as low as 0.4pF. The table below lists all Littelfuse SPA® TVS Diode Arrays by series along with a few key specifications for each. For more information on a particular series, please click the series name. Figure 3, shows a transient which is the result of stored energy within the alternator of an automobile charging system. A similar transient can also be caused by other DC motors in a vehicle. For example, DC motors power amenities such as power locks, seats and windows. These various applications of a DC motor can produce transients that are just as harmful to the sensitive electronic components as transients created in the external environment.